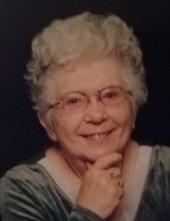 Marion Elizabeth Clark, 89, of Holly, formerly of Dryden, Lapeer & Rochester, died Friday November 16, 2018. She was born March 19, 1929 in Ferndale to parents George and Leah (Kleckner) Foe. Marion married Jack E. Clark on May 24, 1947 in Dryden. Mrs. Clark was proud to have been a Licensed Practical Nurse (LPN) for many years, at Crittenton Hospital, Rochester. She was an avid reader and enjoyed BINGO. Sewing was a regular pastime, she also loved arts and crafts in general. She is survived by her children: Donald (Pam) Clark of Colorado, Carol (Rick Lenz) Clark of Holly, grandchildren: Malinda (Pablo) Rivera, Rebecca Colburn, Sarah (Joseph) Karlson, great-grandchildren: Jacob, Christopher, Leneah, Aaron, Selena, Miquel, Nathaniel, Josiah, siblings: Doris Smith and Eugene Foe. Marion was preceded in death by her husband: Jack, brothers: George and Wilbur Foe, sister: Louise Hughes as well as her parents. Following her own wishes, the family has entrusted Muir Brothers Funeral Home, Lapeer with cremation. A memorial service will be 11:00am Tuesday November 27, 2018 at Muir Brothers Funeral Home, Lapeer, officiated by Pastor Drew Jolly. Burial of the cremated remains will take place in Mt. Pleasant Cemetery, Dryden, at a later date. Just prior to the service. "Email Address" would like to share the life celebration of Marion Elizabeth Clark. Click on the "link" to go to share a favorite memory or leave a condolence message for the family.